Clark Construction에서 3D 레이저 스캔과 Rhino의 Pointools을 사용하여 Veterans Affairs Medical Center 빌딩을 BIM으로 변환하였습니다. 러시아 노보시비르스크, 2010년1월4일 - CAD/CAM/CAE/PLM 마켓용의 다양한 변용 설계 (variational design) 툴, 테크놀로지 컴포넌트, 소프트웨어 개발 서비스를 제공하는 LEDAS Ltd.,에서 오늘 RhinoDirect 베타 릴리스 0.1 을 발표하였습니다. 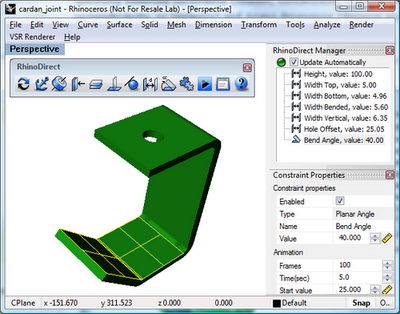 RhinoDirect는 Robert McNeel and Associates에서 개발한 Rhinoceros 3D 모델링 소프트웨어를 위한 새로운 플러그인이며, 지난 달 LEDAS에서 릴리스한 플러그인인 RhinoAssembly의 기능을 기반으로 개발되었습니다. RhinoDirect의 0.1 버전은 www.DrivingDimensions.com/labs.php 에서 무료로 다운로드하실 수 있습니다.